Next-gen flatscreens: can Japan's big names ever catch up with the Koreans? | What Hi-Fi? Next-gen flatscreens: can Japan's big names ever catch up with the Koreans? The race is on to bring the first viable large-screen organic electroluminescence TVs to market. And while both the major South Korean companies have announced plans to have models on the market next year, with LG for example having shown a 31in OEL prototype (above), and recently announcing plans for a 55in model, it seems that Japan's major consumer electronics companies are having to work hard in their efforts to catch up. OEL, or OLED, TVs have long been talked about as the ideal solution for the future: they're light, exceptionally slim, and self-illuminating. 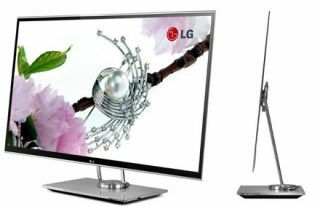 That means they not only promise better resolution and contrast than existing LCD sets, but can also do so without the need for backlighting or colour filters, both of which limit just how slim LCD TVs can be made. And they offer significant energy-efficiencies over the other current flatscreen technology, plasma. The problem is that OEL displays are hard to mass-produce, with very high reject-rates, and the problems escalate as the size of the screen is increased. That explains why most OEL displays to date have been small, for use on smartphones and similar portable devices, and the few TVs or larger-screen displays so far launched using the technology have been eye-wateringly expensive. Sony's 11in XEL-1, for example, was released three years ago, and listed at $2500, or around £1600, when it went on sale in the States. However, since that early promise, Japanese companies appeared for a long time to have got cold feet about OEL technology: Sony showed prototypes of a larger screen at the 2008 CEATEC exhibition in Japan, but since then its OEL project has been put on the back burner as a consumer concern, as the company struggles to turn around its loss-making TV division. To date, the only further products have been monitors aimed at professional users, from TV production to medical applications. But prices are high: an earlier 25in model sold for around £18,000, while a more recent arrival has brought the price down to £5000 and it also has a smaller 17in monitor. That's progress, but it's still a very long way from consumer price levels. However, with the South Korean companies planning TV launches, not to mention working hard to mop up the lucrative display market for high-resolution portable devices – Samsung has 80% of the world market for OEL displays –, it seems Japanese companies are waking up and realising they're going to have to run fast if they stand any chance of catching up. There are rumours that it's an area in which Sharp is very interested, as part of its strategy of moving away from mass-market TV panels and concentrating on the more profitable small-screen displays, plus some very large TV sizes. And it's also thought the planned display merger between Hitachi, Sony and Toshiba should have the wherewithal to make an impact in the market, should the differences between the companies be resolved. After all, Sony clearly has the capability, as I already mentioned, while Toshiba has expertise in the manufacture of the low-temperature polysilicon used in the electrodes of such sets, and Toshiba has been developing OEL technology with Canon. The printers-to-cameras company's subsidiary, Tokki Corporation, has highly sophisticated technology for the production of such panels. Meanwhile, Tokyo Electron, which makes equipment for panel production, is investing between Y2bn and Y3bn – up to £25m – in new technology to make OEL panels. It plans to develop an inkjet system to spray the organic materials onto glass, in association with Seiko Epson, and expects to start mass-production in 2013. It's also looking at the deposition method used by Samsung to make OEL panels, and is said to have shipped trial equipment to panel manufacturers both in Japan and overseas. But with Samsung already able to make OEL panels of what is called the 5.5th generation – using glass 1.3x1.5m, and thus very much large enough to yield commercially-viable TV-size screens –, it remains to be seen whether Japan's major consumer electronics companies will be able to eat away at the lead their South Korean rivals have established.